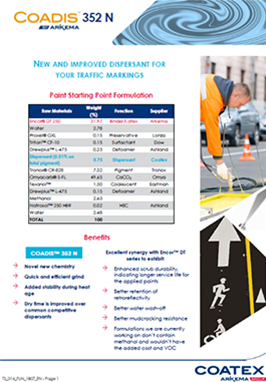 Coadis™ 352 N by Coatex (Arkema Group) is a low viscosity, dispersing agent for traffic paints. It is a polycarboxylate in aqueous solution. It provides excellent storage stability, high efficiency, formulation robustness & latitude and excellent synergy with ENCOR® DT series. It is designed to quickly and efficiently grind the pigments and fillers commonly utilized in waterborne traffic paints. 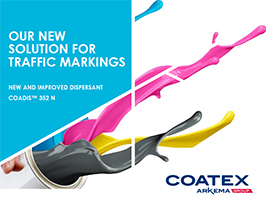 Coadis™ 352 N ensures stability of the paint without impacting drying time. Recommended dosage level varies from 0.15 to 0.5% of active ingredient.